Large-scale investments in fragile states – in Latin America, Africa, the former Soviet Union and Asia – become magnets for conflict, which undermines business, development and security. International policy responds with regulation, state-building and institutional reform, with poor and often perverse results. Caught up in old ways of thinking about conflict and fragility, and an age-old fight over whether multinational corporations are good or bad for peaceful development, it leaves business-related conflicts in fragile states to multiply and fester. 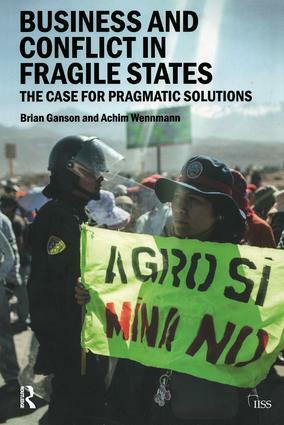 Surveying a new strategic landscape of business and conflict, Brian Ganson and Achim Wennmann conclude that neither company shareholders nor advocates for peaceful development need, or should, accept the growing cost of business-related conflict in fragile states. Drawing on decades of experience from mainstream conflict prevention and violence reduction efforts, as well as promising company practice, they show that even acute conflict is manageable when dealt with pragmatically, locally and on its own terms. The analysis and conclusions of this Adelphi book will interest policymakers, business leaders and community advocates alike – all those hoping to mitigate today’s conflicts while helping to reduce fragility and build a firmer foundation for inclusive development. Brian Ganson, JD, is Head, Africa Centre for Dispute Settlement and Extraordinary Associate Professor, University of Stellenbosch Business School, Cape Town, South Africa. His research and consulting with multinational companies, governments, community advocates and human rights defenders focus on the nexus of business, conflict and development. Achim Wennmann is Senior Researcher at the Centre on Conflict, Development and Peacebuilding (CCDP) of the Graduate Institute of International and Development Studies in Geneva; and Executive Coordinator of the Geneva Peacebuilding Platform. He is author of The Political Economy of Peacemaking. The Adelphi series is The International Institute for Strategic Studies' flagship contribution to policy-relevant, original academic research. Six books are published each year. They provide rigorous analysis of contemporary strategic and defence topics that is useful to politicians and diplomats, as well as academic researchers, foreign-affairs analysts, defence commentators and journalists.